Dining on Rhapsody of the Seas is varied, consistent and tasty. Collectively, the complimentary and for-fee options offer a good number of choices for every type of palate and dietary need. Most passengers are content with meals in the dining room and buffet, but the specialty restaurants, nonetheless, offer some novelty. Be sure to check the cruise bulletin for restaurant hours -- they can vary during the cruise, and sometimes even crew members taking reservations can get confused. Edelweiss (Decks 4 and 5): Bedecked in maroon-and-gold upholstery and carpeting, the Edelweiss Restaurant is Rhapsody of the Seas' main dining room and spans two decks, connected by a sweeping staircase. Edelweiss serves all three meals. Breakfast and lunch operate on an open-seating plan and serve many of the same items as the buffet: Belgian waffles, eggs Benedict and omelets made to order for breakfast; Thai curry with peanut sauce and citrus salad for lunch. On sea days, the Edelweiss Restaurant transforms into the Royal Brasserie for lunch, which serves hearty gastropub-type fare, such as steak, kidney and mushroom pies; fish and chips; and quarter-pound burgers, as well as decadent desserts like chocolate profiteroles and warm apple and rhubarb crumble. Tables are assigned for dinner, for which there are two seatings: 5:30 (early) and 8:30 p.m. (late). Flexible-time dining, without assigned tables, is also available for a limited number of diners from 5:30 to 8:45 p.m.
Appetizers at dinner consist of soups, salads and more creative inventions, both hot and cold: escargots with melted garlic-herb butter and chilled strawberry bisque, for example. The kitchen can adapt dishes to suit dietary restrictions. Icons on the menu indicate gluten-free, dairy-free and vegetarian options (there are also tons of sugar-free desserts). Dinner entrees could include roasted pork loin with black truffle sauce, garlic tiger shrimp with vegetables or eggplant parmigiana. If you aren't in the mood for one of the chef's more "spur of the moment" creations, a fixed menu of alternatives is available every day, in which a Manhattan strip steak or linguine with pomodoro sauce are among the choices. Standout desserts include creme brulee, chocolate almond cake and the sugar-free strawberry charlotte. Service is prompt, courteous and attentive. A wine steward will assist you with your beverage choice upon arrival, and the waiter assigned to your table will be more than happy to offer his or her (often spot-on) recommendations on what to order off the menu of the day before delivering fresh bread to your table. Windjammer Cafe (Deck 9): The indoor Windjammer Cafe is spread out around two, long semicircular buffet stations and surrounded by a series of side stations. It's busiest on embarkation day and at breakfast and lunch, when the queues seem interminable and when there never seems to be a free table. For dinner, the chaotic atmosphere calms down, and the Windjammer takes on a more subdued feel, where you can enjoy your dinner in peace. Windjammer is open for breakfast from 7 to 11 a.m., lunch from noon to 3 p.m. and dinner from 6 to 9 p.m.
For the morning meal, you'll find the usual suspects: muffins and pastries; eggs and omelets; bacon, ham and sausages; cereal, fruit and yogurt; and pancakes and waffles. For lunch and dinner, options could include roasted chicken, grilled vegetables, pizza, soups, sandwiches and international foods such as empanadas, fried rice, vegetable curry and pork vindaloo. In addition, there's a carving station, pasta bar, shrimp cocktail station, Mongolian barbecue and gluten-free corner with some items that actually look appetizing. The fresh breads -- pumpkin rolls, or onion and pepper focaccia, for example -- are excellent; spreads such as cinnamon and cayenne butter make them even better. Some desserts have wow-worthy presentations: a gigantic apple pie, a towering croquembouche (small round pastries held together by threads of caramel). Waiters circulate among the tables with trays of soft drinks (for an extra fee) or cookies; an ice cream cart, where you can choose your own toppings, also makes the rounds at lunch. The food is good for a cruise ship buffet. The menu changes every day, and there's enough variety so that there's something for everyone. Ice tea, water, lemonade, fruit drinks, coffee and tea are complimentary, but only the water, coffee and tea are available 24 hours a day. Park Cafe (Deck 9; aft): Located in the Solarium, the Park Cafe is where to head in between meals when the buffet is closed. It offers a selection of snacks and light fare, such as soups, pizza, sandwiches, salads and quesadillas. There's also a carving station and fruit and desserts. Because it's the only venue open during off hours up until midnight, the queues can be long to pick up food. It's also open for a light breakfast. Room Service: When the buffet shuts down -- which it does at 9 p.m. -- and you don't feel like making a trek to the Park Cafe, room service is the best bet to get a bite (orders cost $7.95 per delivery, with the exception of continental breakfast). All day choices, which are actually available only from 11 a.m. to 6 a.m., include mainly bar-type food, such as Cobb salad, chicken tenders and cheesesteaks. You can also order breakfast delivered to your cabin from 6 to 11 a.m. Chef's Table (Deck 4, aft); $85: The Chef's Table is an exclusive, intimate experience where passengers get to dine in an elegant room near the kitchen and sample some of the chef's finest dishes. The meal consists of five delicate and delicious courses, including wine pairings. The menu changes, but sample dishes may include scallop carpaccio with yuzu vinaigrette and crispy quinoa and a Maine lobster salad with hearts of palm, pineapple and cilantro. There's a choice of entrees, but you don't get to choose the other courses -- so make sure you read the menu before booking. Chops Grille (Deck 6, aft); $35 for dinner: $22 for lunch: This is, by far, the most popular specialty restaurant on the ship; many passengers head to the dark-wood paneled Chops when celebrating milestones. The classic steakhouse -- awash in burgundy and gold tones -- features favorites, such as wedge salad with blue cheese and prime meats like bone-in ribeye and filet mignon. The Gruyere tater tots and creamed spinach are deliciously decadent accompaniments, and the desserts are just as rich and ridiculously copious. Giovanni's Table (Deck 6, aft); $30 for dinner; $15 for lunch: Located near the Shall We Dance Lounge, Giovanni's Table is an Italian trattoria that serves familiar dishes family style. The whole experience is supposed to be on par with a culinary adventure in the region of Tuscany. Though that may be an exaggerated fantasy, everything about Giovanni's Table is cozy, warm and comforting. It serves dishes such as buffalo mozzarella, linguine with clams and osso buco. During lunch, only a portion of the dinner menu is available. Cafe Latte-tudes (Deck 6, midship); a la carte: This casual counter delivers specialty teas, hot chocolate and espresso-based coffee drinks, such as cappuccinos, lattes and frappes that range in price from $1.75 to $5. Complimentary snacks such as Danish, doughnuts, muffins and croissants are served as an accompaniment. Adjacent to the cafe, Ben & Jerry's ice cream is served for an additional fee starting from $2.50 per scoop. 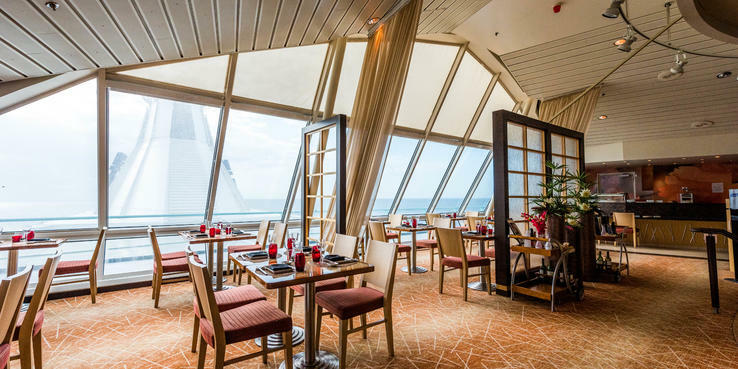 Izumi (Deck 12, midship); a la carte: On a mezzanine above the Crown Lounge, Izumi -- Royal Caribbean's Asian-fusion restaurant -- occupies one of the highest decks and boasts high ceilings with broad-reaching views. The decor is sleek and minimalist, with neutral tones and orange chairs, screens that serve as partitions and kimonos adorning the walls. The menu features mostly Japanese items, with a variety of sushi, sashimi and rolls (highly recommended: the poke tacos), as well as other hot and cold items, such as a sesame tofu salad, udon soups, vegetable tempura and skewers cooked on hot rock stones, with three dipping sauces.